1. Heat oil in heavy large skillet over medium heat. Add bell pepper and onion and saute until tender, about 5 minutes. 2. Transfer to bowl. 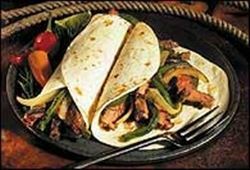 Add steak to skillet and cook until no longer pink, about 2 minutes add jalape�o, cumin, chili powder and salt and pepper to taste. 3. Transfer to heated bowl. In a medium sized bowl combine the corn, tomatoes, avocado, cilantro, vinegar, and oil. 4. Warm tortillas over gas flame or electric burner until they begin to color. Transfer to a napkin-lined basket. To serve, have diners assemble their own tacos at the table.